SSC GD Constable Admit Card 2019: Hopefuls eagerly waiting for the SSC GD Constable Admit Card has a very Good News..!! The Admit Card and the SSC GD Constable Exam Date are out now. As the officials released the SSC GD Constable Hall Ticket on 4th February 2019. Candidates are still searching for the Download links. No more worries, we provided complete details and the Download links to help the aspirants. Accordingly, the GD Constable Online Exam is scheduled from 11th February to 11th March 2019. Moreover, the clear details of the SSC General Duty Constable Selection Process are given in this article. Also, you can get furthermore information like essential documents and proofs to be carried for the Examination. Refer to get complete details. The Staff Selection Commission conducts the selection process for the General Duty Constable posts in 3 Rounds. They are Online examination, Physical Efficiency Test (PET), Physical Standard Test (PST). Also, the SSC GD Constable Exam Date is released and scheduled from 11th February to 11th March 2019. From this section, you can get complete details of the selection rounds for both Male and Female candidates. Online Examination: Candidates should attempt the exam on General awareness, Aptitude, English, Reasoning and Elementary Mathematics for a duration of 90 minutes in the first round of SSC General Duty Constable Selection Process. Physical Efficiency Test (PET): This Test includes a Race for both male and female candidates separately. Therefore Male candidates should race 5 Km in 24 minutes and Female candidates need to race 1.6 Km in 8 (1/2) minutes. Physical Standard Test (PST): This round is done to test their physical strengths like Height (General, SC, ST, OBC), Chest Expansion (General, SC, ST, OBC), Visual Acuity etc. Many hopefuls interested to get Job in the Staff Selection Commission now can check their SSC GD Constable Hall Ticket from the Official website which is given in this page. Also, the Exam Date is released, so candidates are suggested to get prepared for all the Tests. The SSC Board has released the SSC GD Constable Exam Date from 11th February 2019 To 11th March 2019. So, the candidates can take their exam in the date scheduled for each person through online. Also, the Online Exam Center for the Candidate is specified in the SSC GD Constable Admit Card. Carry any one of the given Identity proofs for the Examination Hall along with the Hall Ticket. The Officials of the Staff Selection Commission are not allowing without the ID Proofs. Candidates can check their information in the Admit Card after downloading it. If any mistake on the personal details then you need to notify to the Higher Authorities of SSC. First, candidates need to enter into the official website ssc.nic.in. Need to search for the Admit card section that appears in the top of the home page. And then click on the regional wise link provided in the admit card page. Click on the link and fill the required fields asked for and also fill the Captcha if required. Before submission, once check for confirmation. Finally, you will get the SSC GD Constable Admit Card. Similarly, you can see your scheduled SSC GD Constable Exam Date on the Admit Card. Finally, Download it and make more copies of it for further professional purpose. 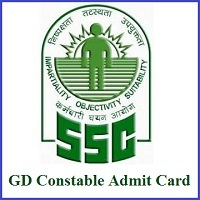 Got all the details about the SSC GD Constable Admit Card 2019? then, keep in touch with for more updates through Freshers Now.